Have you been watching short-term interest rates? If you haven’t, you darn well better pay attention because the jump in these rates could very well be the most dangerous development that you aren’t paying attention to. In July 2016, the two-year Treasury yield dropped to as low as 0.53%. Six rate hikes from the Federal Reserve later, and the yield on that same two-year Treasury note has increased to 2.6% today. In fact, the yield on the 2-year Treasury has increased for eight consecutive quarters and 19 out of the last 22 months, the longest such streaks in three decades. That’s good news if you want to buy a 2-year Treasury today — but not-so-good for the investors who locked in the low yields of 2016. Of course, none of us can go back in time, but the key point I want to make is that you can now get a risk-free return from 2-year Treasuries that is higher than the dividend yield of the S&P 500. Not only do 2-year notes yield more than stocks, but so do six-month and 1-year Treasury bills. That increase in yields isn’t lost on foreign investors, either. 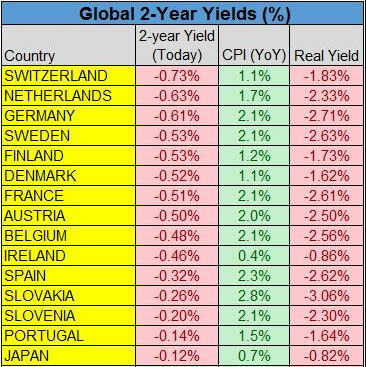 While our rates have been increasing, that isn’t true for the rest of the world. 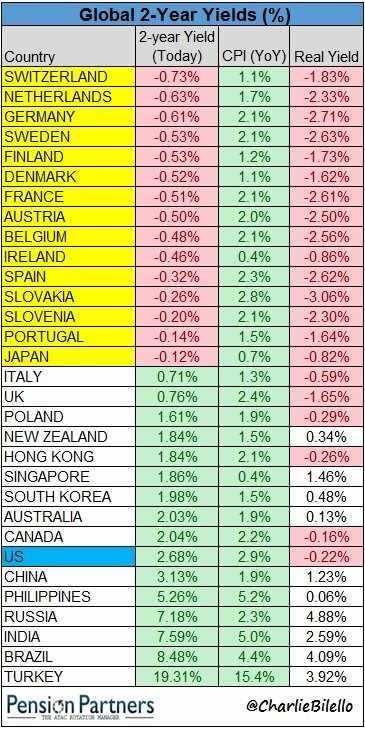 In fact, there are 15 countries still suffering with negative yields. In short, those higher yields mean more competition for stocks. 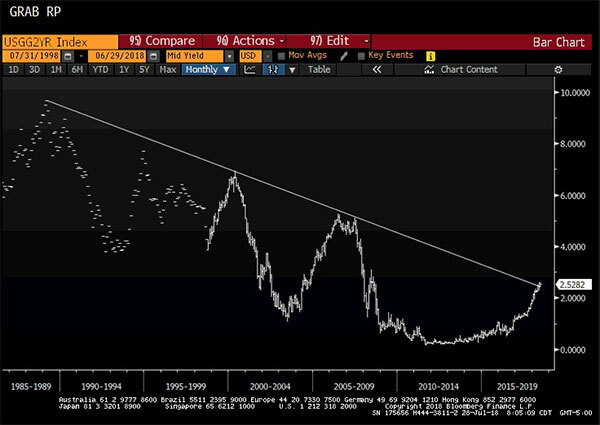 And I suggest that anybody who is fully invested in the stock market consider swapping some of their equities for shorter-term Treasuries in case stocks head to the dumper. Of course, the bull market could keep roaring ahead. But let’s consider three — bull, flat and bear — market scenarios and what would happen if you allocated half of your portfolio to 2-year Treasury notes over the next two years. Scenario #1: Bull Market Rips Higher by 20%. The stock portion of your 50/50 portfolio would be 20% higher (or 10% a year). So, your two-year annualized portfolio return would be around 12.6%. That’s 10% from stocks and 2.6% from bonds. Scenario #2: Stock Market Goes Nowhere. 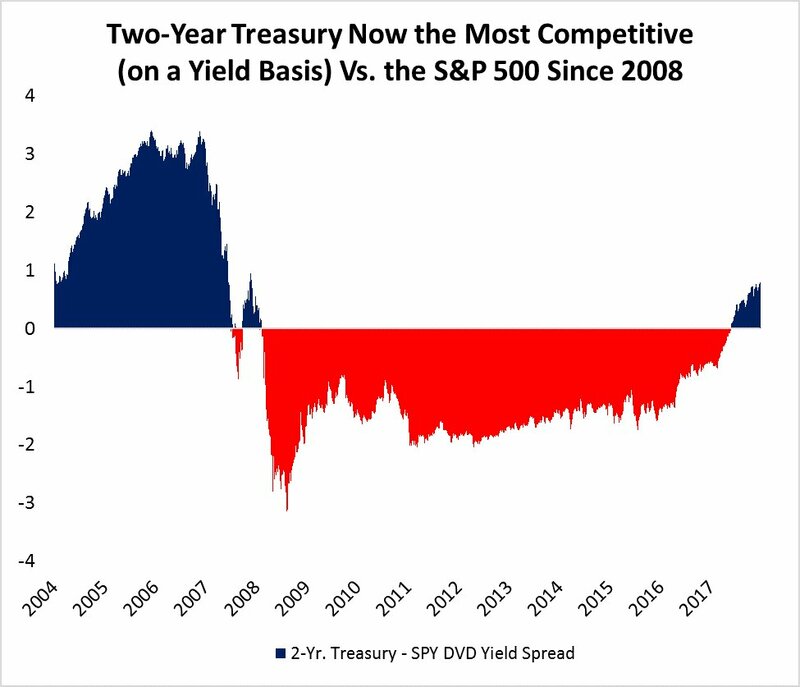 If the S&P 500 goes nowhere for two years, you get its dividend yield of 1.8% plus another 2.6% from your bond position, or 2.2% a year. Scenario #3: Stock Market Drops 20%. The stock market drops by 20% or more roughly every 3.5 years (32 times since 1900). If the S&P 500 is down 20% two years from now, the loss in portfolio value is moderated by the S&P dividend (1.8%) and the 2-year Treasuries (2.6%). That would result in an overall portfolio loss of -7.8%. Look, if the stock market tumbled by 20%, most investors would be very happy to only lose 7.8%. That is exactly the risk-reducing role that bonds have traditionally delivered. 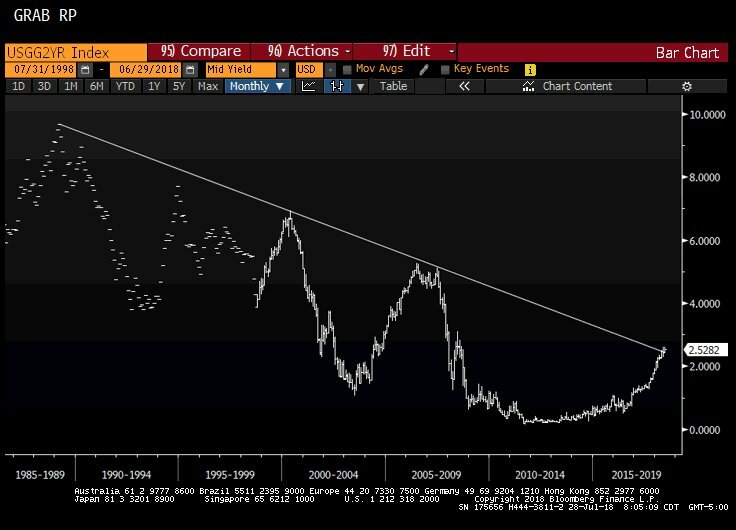 Of course, the stock market can fall a lot more than 20% — and that risk-reducing role of Treasuries becomes even more important then. Thanks to the increase in the 2-year Treasury yield, you can not only lower your risk, but you can get paid a decent-but-modest amount on your bonds. Football coaches like to say that championships are won with defense — and the same is true of long-term portfolio returns. Defense also pays better today than it has for years. P.S. Whatever you do, don't "buy, hold and pray." It might be America's most popular investment strategy, but it's also the most dangerous. Click here for my top six tips that can help you thrive in bear-market conditions.